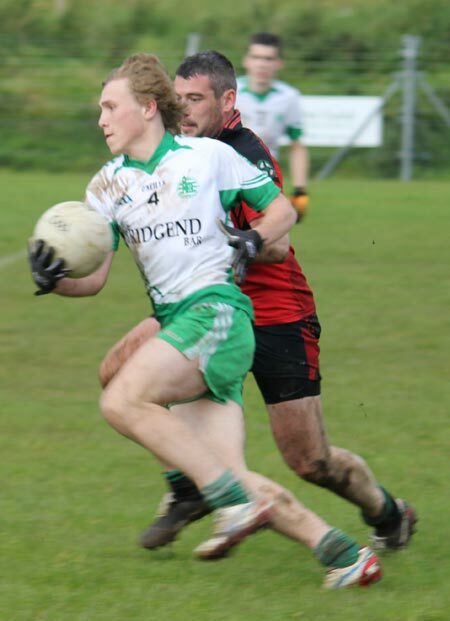 Aodh Ruadh reserves showed a lot of grit and some class to come through a tough championship encounter against Naomh Br�d with a win. 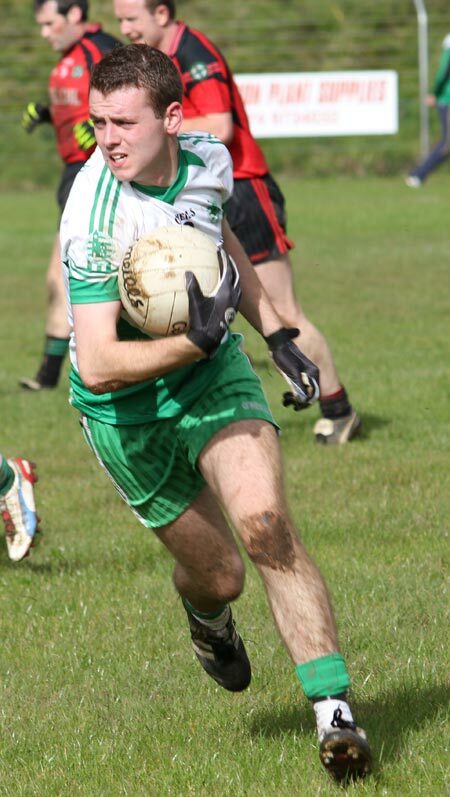 Ballyshannon had the benefit of the wind in the first half and worked up a 1-5 to 0-2 lead by the end of the first quarter, David McGurrin hitting the back of the net for the visitors. 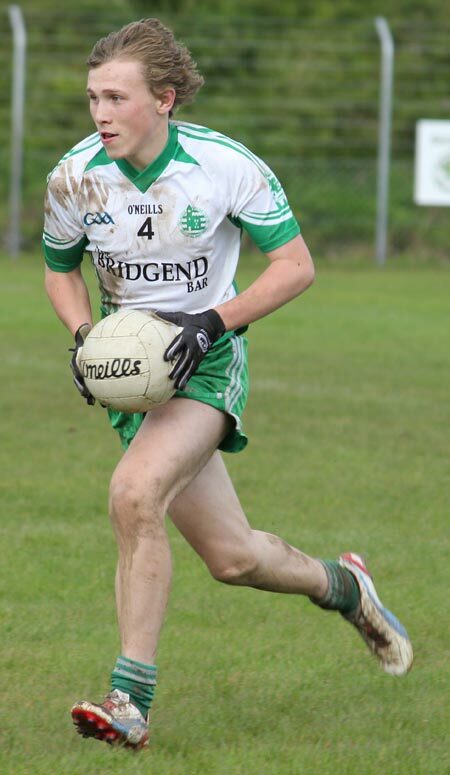 Yet the Ballintra / Laghey boys were competitive throughout that first 15 minutes and it was no surprise when they started to reel in the visitors. 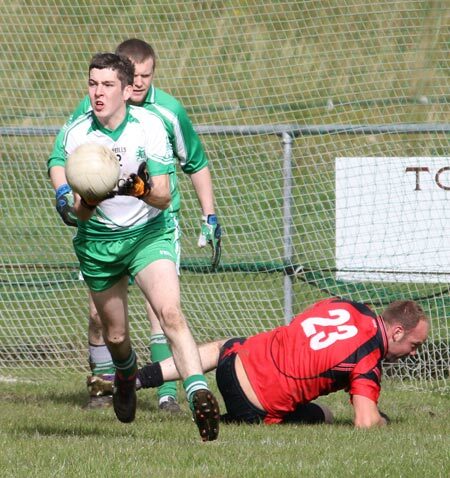 Stephen McDaid stabbed home a real poacher's goal with ten minutes left in the half to set the comeback rolling. 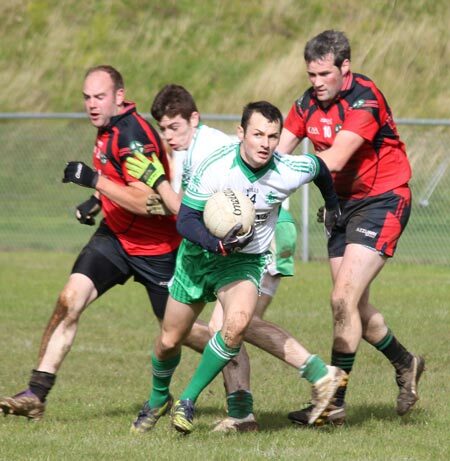 Naomh Br�d managed to level the game at 1-5 apiece before Aodh Ruadh, through David McGurrin edged the gap out to two points as the whistle went for half time. 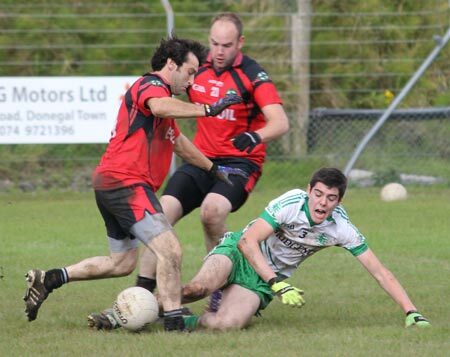 The Ernesiders faced the wind in the second half and it looked like the initiative lay with Naomh Br�d. 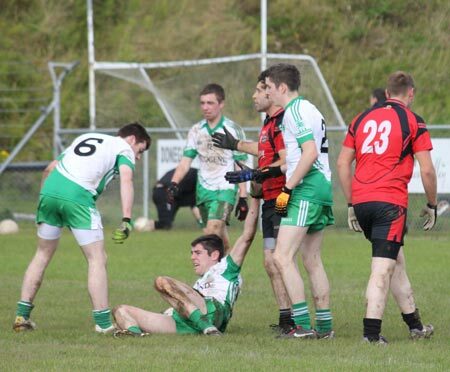 Aodh Ruadh turned that logic on its head though, turning in a barnstorming 30 minutes of no-nonsense football. 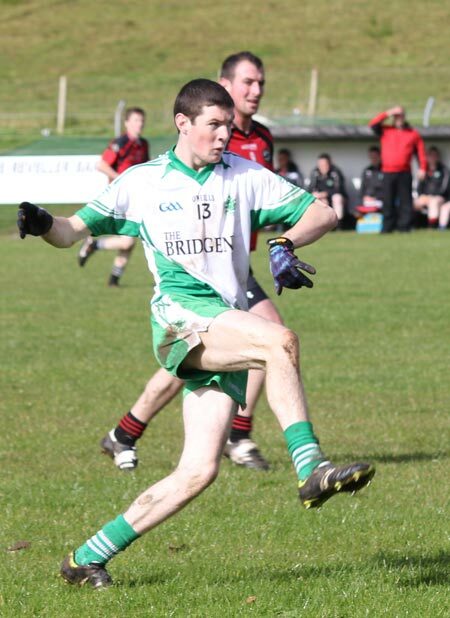 Notice was served three minutes into the half when David McGurrin converted a very difficult free. Although not far out, the swirling wind meant the margin for error was minimal. 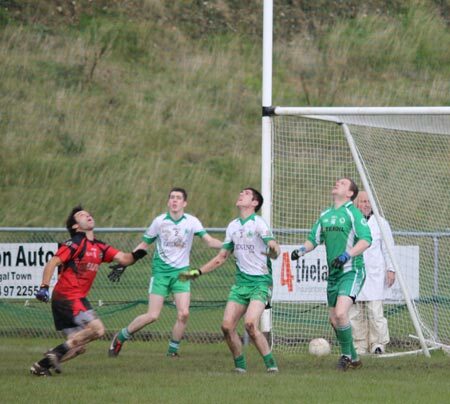 Five minutes later Dermot Slevin stroked over a free to put two scores in the contest. 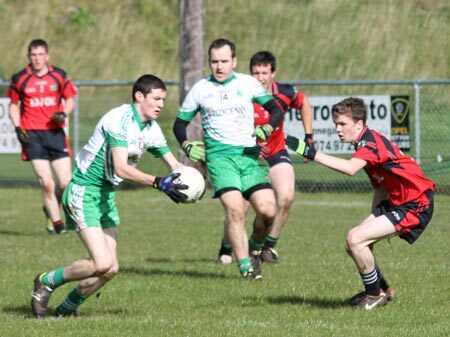 As the game moved into the final quarter Slevin was on the mark once more taking the scores to 1-10 to 1-5. 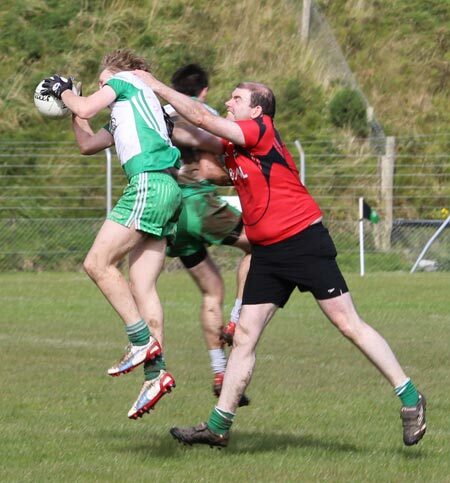 It was at this point that Naomh Br�d got a chink of light. 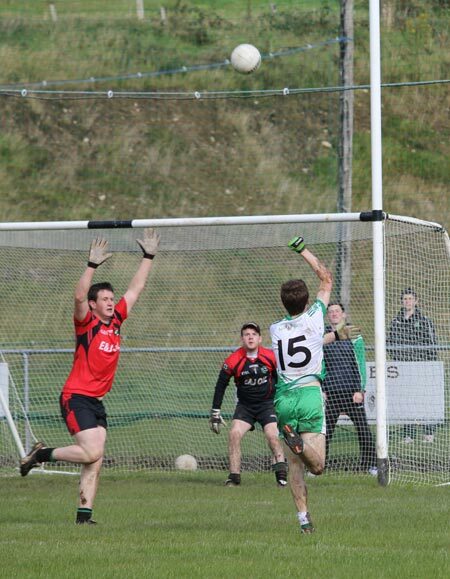 The homesters broke up the field and unleashed Padraig Rooney who raked through the Aodh Ruadh defensive cover and got clear on goal. His rasping shot looked unstoppable, but it was somehow parried away by the diving frame of Karl O'Brien for a 45. 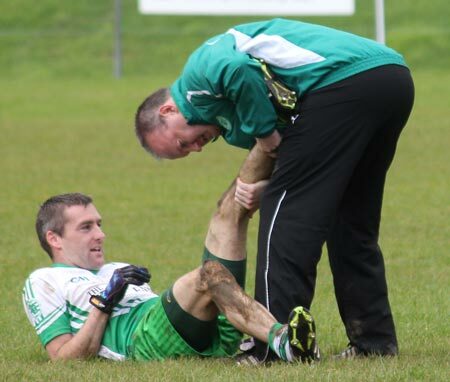 David McGurrin hit the insurance point in the 54th minute to see Aodh Ruadh take a first leg win back to Ballyshannon. The game was won in the second half. In particular Christopher 'Spanny' Goan put in a great shift, winning a lot of ball and taking a lot of punishment. 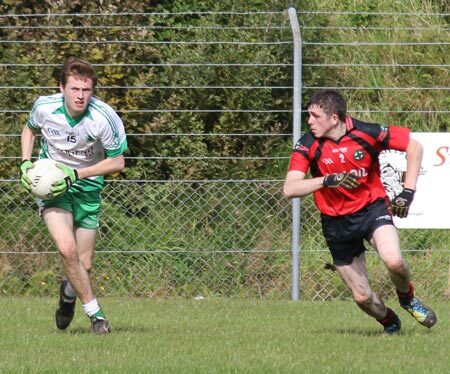 Damien Cleary was a cool and composed presence on the edge of the square, while Ronan McGurrin soldiered well in the middle of the field. 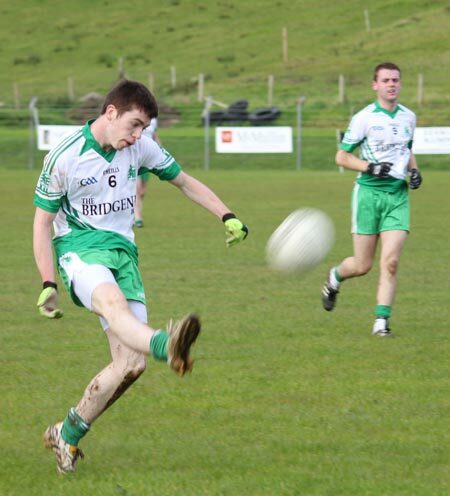 Up front his brother David showed he is developing a taste for senior football with an accomplished shooting display, all the more remarkable for the distinctly difficult conditions created by the swirling breeze at P�irc Naomh Br�d. 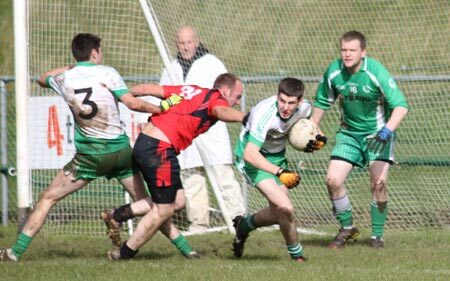 Dermot Slevin deployed his experience to good effect in the second half and his two frees were valuable scores in the overall context of the game. 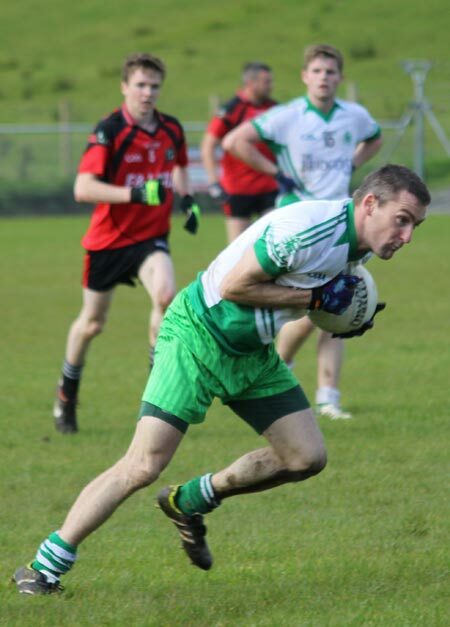 Christy Price; Richard Walsh, Jamie Dorrian, Liam Duffy; Alan Quinn, Donal 'Skimmer' Martin, Michael Quinn (0-1); Stephen Walls, Padraig Gormley; Stephen McDaid (1-1), Sean Rooney, Eoin 'Squeak' Haron; Brendan Griffith (0-2f), Padraig Rooney (0-1), Ronan Cassidy. Yellow card: Alan Quinn: 37 minutes. 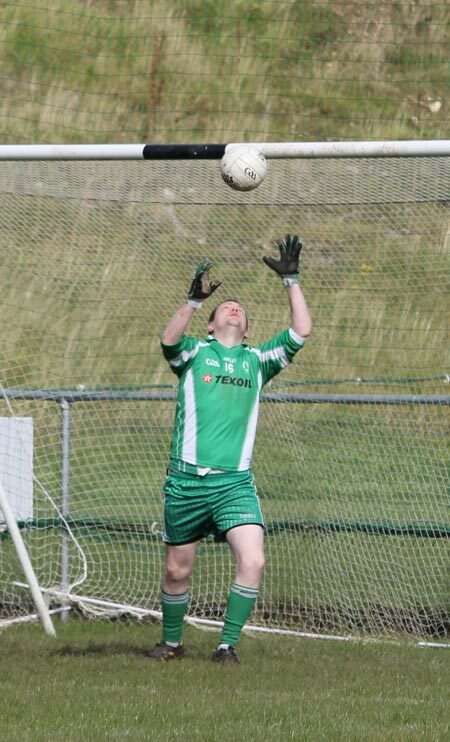 Karl O'Brien; Gary Carty, Damien Cleary, Ryan Patton; Stephen McGrath, Kieran Keown (0-1), Ronan Matthews; Aidan Murray, Ronan McGurrin; Ryan Granaghan, Dermot Slevin (0-2), Christopher Goan; Johnny Gethins, Stephen Perry, David McGurrin (1-8, 3f). Substitutes: Matthew Thompson for Aidan Murray: 38 minutes; David Finnerty for Stephen McGrath: 38 minutes; Jamie McDonald for : Johnny Gethins: 40 minutes; Niall Murray for Ryan Granaghan: 48 minutes; PJ Gillespie for Ronan Matthews: 55 minutes; Daniel Kelly, Darren Gethins. Management: Val Murray, Shane Ward and Greg Sweeney.